A red, yellow, and white flower with a lime green stem and eyes. Turns Mario into Fire Mario. In Super Mario Bros., if Mario collects a Fire Flower, he will get the ability to shoot fireballs by pressing . The fireballs may be a strong and handy projectile to use because it defeats most enemies and even Bowser from a range. Only two fireballs may be thrown at once. If Mario gets hit while he is in this form, he will revert back to Small Mario. If Small Mario gets a Fire Flower, he will only transform into Super Mario. Fire Flowers return in Super Mario Bros.: The Lost Levels, granting Mario the same ability and retaining the same appearance as Super Mario Bros. In Super Mario Bros. 3, they are the third most common power-up, the first being a Super Mushroom and the second being a Super Leaf. They, like before, grant Mario the ability to shoot fireballs. Not much has changed since Super Mario Bros. regarding their function; they can still defeat Bowser, although he can withstand many more fireball hits than his original incarnation. The American version of this game introduced the idea that Fire Mario reverted to Super Mario upon being hit, rather than Small Mario, as in other games. This was retained in all subsequent releases of this game. In Super Mario World, Fire Flowers receive a change in appearance. They appear as happy orange tulip-like plants, though early test cartridges used a circular appearance like in the other games. Other than this change, nothing has been changed in function. This game introduces the idea of storing power-ups, having the previous one released when Mario is hit by an enemy when in a super powered form. Because of this, Fire Mario reverts back to Small Mario in the SNES version, as he can get the Super Mushroom (or better) that he had before. Additionally, because of the added feature of spin-jumping when Mario does so by pressing , he shoots out fireballs left and right while in the air. In the Game Boy Advance version, Mario retains the new behavior added on by Super Mario Bros. 3 in which Fire Mario immediately becomes Super Mario upon being hit. Replaced with Superball Flowers in Super Mario Land, Fire Flowers appear in Super Mario Land 2: 6 Golden Coins with the same design as in Super Mario World. While the Fire Flower acts in the same way as any other title, Mario's fire form in this game has a feather on top of his hat instead of changing the color of his clothes; this is most likely due to the lack of colors on a Game Boy. Wario also uses a Fire Flower to become Fire Wario during the third portion of the final boss battle. Unlike most other games, a Fire Flower will appear regardless of Mario's current form, meaning one can appear even if Mario is Small Mario. In New Super Mario Bros., Fire Flowers can be considered stronger, or weaker. A large number of enemies are immune to fire, but all bosses except for Dry Bowser can be defeated using fire. 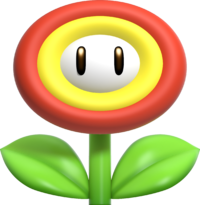 Otherwise, they act as they do in previous games, and their appearance returns to their Super Mario Bros. appearance, but with a red, yellow and white flower with eyes. Blocks containing Super Mushrooms or Fire Flowers are much more common than in previous games. Mario can still only shoot two fireballs at once. In Super Mario Galaxy, when Mario or Luigi obtains this item, he will go into his Fire form, allowing him to throw fireballs (by shaking the Wii Remote; this move replaces the Spin) to defeat enemies and light torches. Unlike in prior games, where the power-up lasts until the player takes damage, the power-up only lasts 20 seconds, although Mario can still take damage in this form without the Fire Flower wearing off. Also, unlike the other games, Mario can throw more than two fireballs at once, but he cannot use them underwater. These flowers first appear in the Freezeflame Galaxy along with its counterpart, the Ice Flower. They also appear in the Dusty Dune Galaxy, Deep Dark Galaxy and Snow Cap Galaxy. Fire Flowers appear in New Super Mario Bros. Wii, having the same effect as in New Super Mario Bros. for the DS. If a fireball is thrown at a character in a bubble, the character's bubble will pop. Fireballs thrown can also get eaten by Yoshi and spat out as projectiles. A similar item called the Ice Flower also appears. They have nearly the same effect, except the ice balls thrown are slower, break when coming in contact with the floor after bouncing once, and freeze enemies, rather than defeating them (although, Lava Bubbles, enemy fireballs, and magic blasts are considered exceptions). The Fire Flower reappears in Super Mario Galaxy 2. Nothing has changed about the Fire Flower from Super Mario Galaxy, and it therefore has the same function as it did in that game. It makes its first appearance in a new minigame called Crate Burning, which appears in only two missions in the entire game: "The Great Crate Incinerator" in the Rightside Down Galaxy and "Burning Upside Dizzy" in the Upside Dizzy Galaxy. In this minigame, the player is presented with numerous breakable crates, all of which need to be burned within a short time limit via the use of a Fire Flower in order to earn the Power Star for the missions. Fire Flowers also appear while fighting Squizzard in the Slipsand Galaxy's first and third missions, and are necessary to defeat him. The Fire Flower reappears once more in Super Mario 3D Land, where it has the same functionality as in the 2D Mario games; unlike in the Super Mario Galaxy games, there is no time limit on Fire Mario. The fireballs thrown now bounce off walls and disappear after a while. The Fire Flower reappears in New Super Mario Bros. 2 where it has the same behavior as in the previous 2D Mario games. They are also used to shoot fireballs in pipes that release coins and items such as a Mega Mushroom, three 1-Up Mushrooms, or a Super Star. The Fire Flower reappears in New Super Mario Bros. U and behaves like in the previous 2D Mario games. The Fire Flower reappears in Super Mario 3D World, and behaves like it did in Super Mario 3D Land. Fire Flowers reappear as power-ups in Super Mario Maker and Super Mario Maker for Nintendo 3DS. They look the same as in previous games, except in the Super Mario Bros. 3 game style, as they have changed colors to look like their modern counterparts. In the Course Maker, they can be placed anywhere, as well as dragged onto Mario to turn him into Fire Mario immediately. They can become status-dependent if the player drags a Super Mushroom on one. While Fire Flowers themselves do not appear in Super Mario Odyssey due to power-ups being replaced by Mario's Capture ability, if Mario encounters Peach in Bowser's Kingdom, she will be wearing a kimono with a Fire Flower pattern on it. The Fire Flower is absent from the NES and SNES versions of Mario is Missing!. However, it does appear in the PC version. They will appear after Luigi has returned all artifacts in each city. He can then use the Fire Flower to burn the Koopaling and make it to the next floor of Bowser's Castle. A Fire Flower from The Super Mario Bros. Super Show! 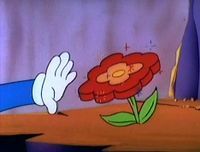 Fire Flowers also appeared in the cartoon television series The Super Mario Bros. Super Show!, The Adventures of Super Mario Bros. 3, and Super Mario World. When Mario or Luigi touch one, they gain their fire powers as normal, although most episodes have their fire costumes either be not changed at all, an orange hat and shirt with red overalls, or the normal red overall/white hat. In Super Mario World, Fire Flowers look like orange roses that are always connected to a ? block and sometimes spit out fireballs themselves. In The Adventures of Super Mario Bros. 3 episode "Reign Storm", the Robot Princess orders all Fire Flowers to be extinguished, as if they were actual fires. The Club Nintendo comic "Super Mario: Verloren in der Zeit" reveals that Fire Flowers have existed since the Stone Age. In this story, Mario uses a Fire Flower to throw Fireballs at a Tyrannosaurus Rex. In a similar manner to how Mario and Luigi have both eaten and "absorbed" Mushrooms throughout their games, there is much controversy over whether Mario must eat a Fire Flower or simply touch it to become Fire Mario. Although most games make Fire Flowers simply disappear upon contact with Mario, this comic shows that Mario does indeed eat Fire Flowers to use their powers. Mario even reveals something about their taste, claiming that Fire Flowers "taste disgusting, but if I eat them, I can shoot Fireballs". A Fire Flower in Super Smash Bros. In the Super Smash Bros. series, the Fire Flower appears as an item in every installment to date. Once picked up, the player can shoot a continuous but short stream of fire from it to damage anyone nearby. It does have a limit to how much fire it can use, and loses its abilities after constant use. The Fire Flower also deals fire damage if it hits an opponent when thrown. In Super Smash Bros., the Fire Flowers are alike to their debut appearance. In Super Smash Bros. Melee, they look like actual flowers with eyes and white petals. From Super Smash Bros. Brawl onwards, the Fire Flower is given its current appearance. In addition, a Fire Flower appears as a sticker in Super Smash Bros. Brawl, which can be used on a fighter in The Subspace Emissary to grant them a Fire Flower at the beginning of a stage. A Fire Flower also appears as a Novice-class support spirit in Super Smash Bros. Ultimate, which, when used, similarly equips the fighter with a Fire Flower at the beginning of a battle. This spirit's core can be combined with the cores of Metal Mario and a Super Mushroom to summon the Gold Mario spirit, or with the cores of Charlotte Aulin and a Freezie to summon the Koume & Kotake spirit. Mario and Luigi use Fireballs as their standard special move. Mario shoots red fireballs, and Luigi shoots green. 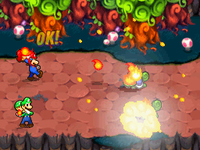 This is the first game in which Mario and Luigi use the flower itself to throw fireballs rather than transforming into their Fire forms, a tactic that would later be used in the Paper Mario and Mario & Luigi series. Within all the Mario Kart games, the Fire Flower most commonly appears as the emblem of the Flower Cup. Below are more notable examples of the appearance of the Fire Flower. A poster with a Fire Flower appears in Moonview Highway in Mario Kart Wii. When racing using a Mii, the face of the Fire Flower will change to that of a random Mii that has been created by the player. Also, a store in Coconut Mall (called "Delfino Dream") sells Mario items. One of these items is a Fire Flower. In Mario Kart 7, the Fire Flower makes its first appearance in the Mario Kart series as a usable item that can be obtained from an Item Box. Using it, a racer can throw several fireballs forward or backward to make racers spin out and drop coins when hit. The Fire Flower will last until ten seconds after it's first used or when the player uses ten fireballs. Fireballs can be thrown with this item by pressing the button. Only three fireballs can be fired at a time; if a fourth is thrown while there are still three fireballs, the first one thrown disappears. The Fire Flower item returns in Mario Kart 8 and Mario Kart 8 Deluxe, and it works the same as it did in Mario Kart 7. Additionally, the statue of Princess Peach in Toad Harbor can be seen holding a Fire Flower in her lowered right hand. The Thousand-Year Door Description Attacks all enemies with fireballs and burns them. During the Paper Mario series, the player can use these items towards the enemies Mario and his partners encountered during their travels. If used against ice enemies, it will deal an extra 2 damage points, whereas it will replenish the health of fire enemies such as the Lava Bubble and Ember. These items can be purchased in many shops, such as in the Shroom Grocery from Toad Town, Koopa's Shop from Koopa Village, and Yoshi's Cabana from Lavalava Island from the Nintendo 64 game Paper Mario. Tayce T. can also cook her own Fire Flower by mixing a Dried Fruit and a Strange Leaf, items that resemble the two parts of a Fire Flower. Also in the Nintendo GameCube game Paper Mario: The Thousand-Year Door, they can be purchased in Toad Bros. Bazaar from Rogueport, Niff T.'s Shop from Petalburg, and Keelhaul Galleria from Keelhaul Key. If used against ice-type enemies, it will deal an extra damage point. Fire Flowers can be also used as ingredients to be made into new items with a help of Tayce T. or Zess T. Recipes can be found below. Like in the Club Nintendo comic mentioned above, this game seemingly confirms that Mario does indeed eat Fire Flowers: a certain optional scene in the Glitz Pit has Mario informing a Lakitu cameraman that he "shoots fire when he eats a flower". In Super Paper Mario, Fire Flowers appear in the skies of Lineland and at Fort Francis, in the room on the left, thus giving them cameos as non-collectible items. Fire Bursts apparently replaced the Fire Flowers from the previous Paper Mario games. The Fire Flower uses the Super Mario World appearance for these games. The Fire Flower returns as a sticker in Paper Mario: Sticker Star, having its appearance from New Super Mario Bros. and onward. Using it in battle turns Mario into Fire Mario, allowing him to throw fireballs at any ground and low-altitude enemies, causing them to disintegrate into ash if their HP is fully depleted. There also exist two other variants of this sticker: the Shiny Fire Flower and the Flashy Fire Flower, which inflict more damage. Fire Flowers also appear on the Battle Spinner; lining up three has the same effect as a Fire Flower sticker. Fire Flowers return in Paper Mario: Color Splash, taking the form of a card and keeping their appearance from the previous game. They come in normal and big variations, and are found since the very beginning of the game, first appearing in Ruddy Road. Partners in Time Description 1: Quickly press the button of the bro with the big fireball to chuck fire! Dream Team Description Use the A and B Buttons for the bros. When the fireballs get big, throw 'em! If you throw all big fireballs, it's bonfire time! Mash the A and B Buttons! Though no Fire Flowers appear in Mario & Luigi: Superstar Saga nor in its remake, Mario & Luigi: Superstar Saga + Bowser's Minions, there is a Bros. Attack known as Fire Bros. that has the same functions as the Fire Flower. The Mario Bros. attacking their foes with this item. In the Nintendo DS game Mario & Luigi: Partners in Time, Fire Flowers are referred to as Bro Flowers. If used, the player attacks all the enemies with a certain amount of fireballs by constantly pressing the button if the big fireball is passed on to Mario or the button if it is passed on to Luigi. The player can also attack flying enemies by pressing the button (if passed to Mario) or the button (if passed to Luigi), making their baby counterparts shoot fireballs, which damage airborne enemies. In addition, the attack may burn their foes. Three new flower items appear in the game: the Mix Flower, Ice Flower, and Copy Flower. They do very similar damage compared with the Ice Flowers, except Fire Flowers burn the enemy, while Ice Flowers randomly decreases the enemies stats, such as attack, defense, and speed. The Fire Flower's tutorial seen in the game. Fire Flowers again appear in Mario & Luigi: Bowser's Inside Story and in Mario & Luigi: Bowser's Inside Story + Bowser Jr.'s Journey as a Special Attack obtained by collecting all ten Pump Works Attack Pieces. They're used almost the same as in Partners in Time, but after a certain number of hits, the player can hit both and buttons to attack simultaneously. Using this item will also turn Mario and Luigi into their Fire forms. The move costs 4 SP (3 with a Budget Charm or Thrift Charm, 2 with a Tight Belt). Rapid button mashing is required to get an Excellent rating on this attack. Unlike in the previous game, Mario and Luigi now wear their actual Fire outfits (white caps and shirts and red/green overalls) from the previous platformers. In the Nintendo 3DS remake, after finishing the Fire Flower Bros. Attack, Mario will clean his hands, spin around and tip his hat, while Luigi spins around and does a finger gun motion. The Fire Flower returns as Luigi's second available Bros. Attack in Mario & Luigi: Dream Team, costing 5 BP. Its Attack Pieces are found in Dozing Sands. This attack can hit any enemy on the ground, and airborne enemy, and may inflict burns. Damage is inflicted after the attack ends, and thus it is impossible for enemies to be defeated during the attack. When used, Mario and Luigi enter their fire forms and begin charging and hurling fireballs at the enemies erratically. The player must press or for Mario and Luigi, respectively, to launch fireballs randomly at the enemies, fully charged fireballs (that flash to signal this) doing the most damage. If the fireballs are fired prematurely, they will do considerably less damage and none at all if the fireballs are charged too long. If all fireballs are thrown appropriately, Mario and Luigi will eventually start charging fireballs rapidly, the player having to mash and in order to throw as many as possible at the enemies. The greater the amount of fireballs thrown, the better the ranking the player receives in the aftermath of the attack, ranging from "OK!" to "Excellent!" ratings. The damage dealt from this attack is given a Fire attribute, and thus deals critical damage to Caccacs and Beehoss. Use the A and B Buttons for the bros. When the fireballs get big, throw 'em! If you throw all big fireballs, it's bonfire time! Mash the A and B Buttons! The Fire Flower returns in Mario & Luigi: Paper Jam. Like in Mario & Luigi: Dream Team, it is one of Luigi's Bros. Attack moves. However, the attack is available from the start of the game, and now acts like it did in Mario & Luigi: Bowser's Inside Story. This move also deals critical damage to paper enemies. In the Nintendo DS game Mario vs. Donkey Kong 2: March of the Minis, when a Mini Mario touches a Fire Flower, he becomes a Fire Mini Mario and begins throwing fireballs within a limited time to knock out enemies or defeat them. These items can be obtained from a ? Block during those levels. In Mario Golf: World Tour, Fire Flowers appear as usable item shots. In addition to increasing shot distance, they also allow the ball to burn through obstructions such as trees. It is the signature item for Princess Daisy. A clothing set, golf ball and set of golf clubs are designed based on this item and are available for use by Miis. In Puzzle & Dragons: Super Mario Bros. Edition, Fire Flowers are used in the place of the Fire Element tiles. The Fire Flower is the emblem of the Flower Cup in Mario Tennis Open. A tennis racket, uniform, wrist bands, and shoes are designed based on this item and are available for Miis to use. A Fire Flower in Animal Crossing. The Fire Flower is available as a furniture item in all four Animal Crossing games. In most games the Fire Flower resembles its original Super Mario Bros. incarnation, with later games using 8-bit stylized graphics, though in Animal Crossing: New Leaf the Fire Flower, along with all other Mario-based items, are given their current appearances. Fire Flowers also appear in the Wii U version of Scribblenauts Unlimited. In Terraria, there is an item called the "Flower of Fire". The item is a wand which most resembles the Super Mario World Fire Flower in appearance. Using it shoots a fireball that bounces across the ground. In the Super Mario Mash-Up Pack in Minecraft, Flint and Steel is replaced by a Fire Flower. NES Super Mario Bros. A flower that breathes flames when you press and hold the attack button. The flames don't last forever, though--after a while, the flower will lose its fiery power. You can also throw Fire Flowers at enemies to set them on fire for a brief moment. In Super Mario Bros., Fire Flowers were used to transform Mario into Fire Mario. NES Super Mario Bros. 3 (02/1990) This Fire Flower won't transform you like in the Mario series, but it will still let you unleash some fiery damage! Holding down the attack button lets you spew fire at your opponents, dealing constant damage to them. You can also throw it at them, but it just doesn't look as cool that way. Unfortunately, picking up this item won't get you a cool outfit like in the Mario series, but you can still use it to shoot fire, and that's what matters. It doesn't do much damage on its own, but fire it continuously and it'll all add up! If you get bored, just throw it at your opponent, but don't expect a massive explosion or anything. For this subject's image gallery, see Gallery:Fire Flower. A Fire Flower made a cameo in Robot Chicken, where then-Nintendo CEO Reggie Fils-Aimé showed it off and then put it into himself, causing his suit to flash several colors. The Superball Flower, an item from Super Mario Land which turns Mario into Superball Mario. The Ice Flower, the opposite of the Fire Flower. ↑ iQue. 马力欧卡丁车7：道具. Retrieved December 6, 2016. ↑ iQue. 超级马力欧 3D乐园:力量提升. Retrieved December 6, 2016. This page was last edited on April 19, 2019, at 07:02.